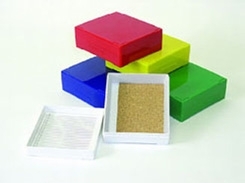 Sturdy ABS plastic box with our exclusive self locking lid holds up to 25 slides and has cork lined bottom. Index paper in lid corresponds with embossed numerals on bottom of box. Designed to stack. White only.